Leiden Special Collections Blog - Articles - A closed book? Sometimes we come across a book that has not been read before, despite it being centuries old. Such was the case with Nouveau traité des instrumens de chirurgie les plus utiles, et de plusieurs nouvelles machines propres pour les maladies des os, by René Jacques Croissant de Garengeot, published in The Hague by Henri Scheurleer in 1725. The book can’t be read because the edges are uncut. Why do we keep it this way and does this not conflict with the purpose of preserving it? The book was published in two volumes, in octavo format, and is richly illustrated with engravings of medical instruments. The physical appearance of the two volumes tells us something about its context. They are bound in cheap sheepskin, the lowest quality of leather a bookbinder had available. This leather, tawed with alum salts that resulted in a crème colour, was dyed red, as was common in the eighteenth century; perhaps it initially made the leather resemble the more expensive red Morocco goatskin, which was still in fashion at the time for the higher end of the market. The boards are covered with comb marbled papers, using blue, red and ochre pigments. The combined materials resulted in rather attractive books, yet this was a low budget type of binding quite typical for the Netherlands. The relative simple structure of the books shows that the bookbinder had economised not only on the covering materials. A so-called two-on sewing was applied, meaning that the sewing thread passes through two gatherings in one row, saving thread and time. Endbands were not provided, another way to reduce costs. Lastly, the edges of the textblock remained uncut. The cutting of the edges served a few purposes. Clean cut edges allowed for easier leafing through the book, and in addition such edges could be coloured, marbled or gilded, though many textblocks had their edges cut without further embellishment. It had a practical reason as well: without cutting the edges the book would have inaccessible pages, since the binder sewed the gatherings with the folds of the folded printed sheets intact. Depending on the format of the book, the large printed sheet is folded once or multiple times, and the folded edges appear at the head edge or head and fore-edge. Drawing a knife or a plough through the paper edges would rid the textblock of these folds and give access to all the pages. There are, however, many examples of books without clean cut edges in which the folded edges were opened individually with a letter opener or similar tool. It often concerns books bought by users who were simply interested in the content and usability of the book, not in a fashionably bound item. They may have favoured uncut volumes because those were a little cheaper still or because it would leave them with book pages slightly larger than the ones that the bookbinder had cut, offering more space in the margins for annotations. What is remarkable in this specific case is that the edges were not opened. The books belonged to Albert Verrijst (1735-1803), whose substantial library was bequeathed to the university in 1806; apparently, he never found use for the book or time to read it. 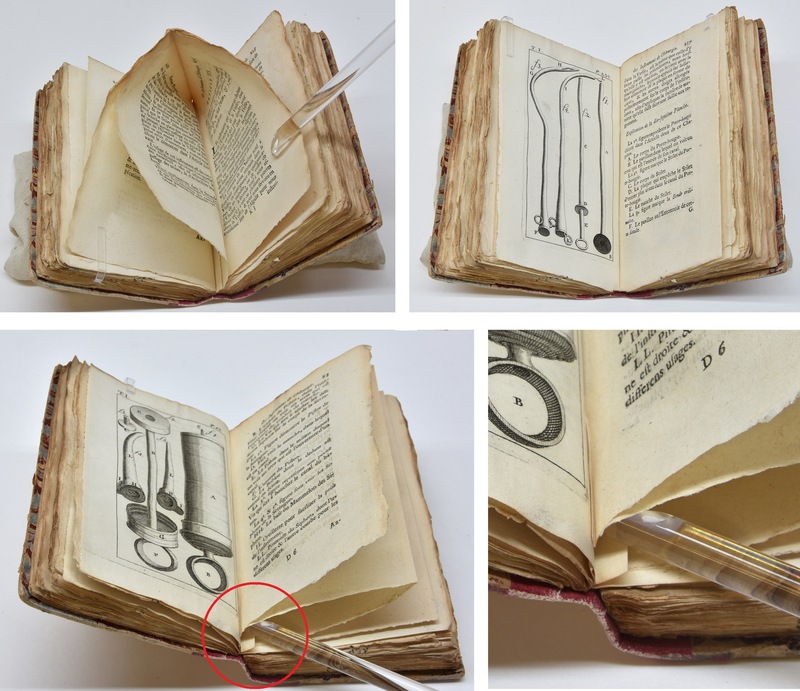 This condition of the volumes now gives us a rare insight into the bookbinding practice. Though we knew that bookbinders choose to sew gatherings with closed edges – it probably speeded up the process, these illustrated volumes give evidence of another detail of the practice. Intaglio prints (engravings and etchings) were usually made in a print shop other than the book printer’s, because it requires a different press than the book press geared to relief printing. The plates can therefore not be printed together with the text but were produced individually and subsequently inserted into the book. The plates could either be glued onto paper stubs, as was often done with atlases, or the pages were hooked around the text leaves and thus sewn. The two uncut volumes show the effort the bookbinder made to position all the plates carefully between the unopened pages, and then secured their position with the sewing; this must have been complicated as the small edges of the paper folds in the gutter were prone to slip out of position. Since most books have cut edges they do not so readily shed light on this aspect of the bookbinder’s trade. Therefore, these volumes have become important material witnesses. As the same edition of this book is available in Google books (volume one from the collection of the National Library of the Czech republic and volume two from the University of Amsterdam) we can decide to preserve our specimen as it is, keeping it available for physical research; a clamshell box was provided for further protection. The upper left image shows a closed edge of the folded sheet with a small hooked-in guard in the gutter, next to it the inserted plate corresponding with the hooked-in guard. The lower left image shows a plate with its guard nested between the unopend pages next to it; the lower right image is a detail of this characteristic.